The theater offers a free shuttle from the Giant Parking Lot. Anyone interested is welcome to join us at Paradise Pizza BYOB in that same parking lot for dinner before the show. 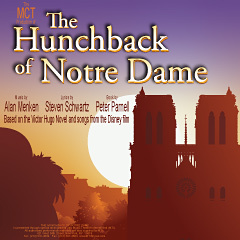 Based on the Victor Hugo novel and songs from the Disney animated feature, The Hunchback of Notre Dame showcases the film's Academy Award- nominated score, as well as new songs by Menkin an Schwartz. Peter Parnell's new book embraces story theatre and features verbatim passages from Hugo's gothic novel. RSVP Needed By NOVEMBER 7th. Contact Sandy Bradley.